Justin Timberlake took to Instagram Sunday to show off his baby boy to the world. 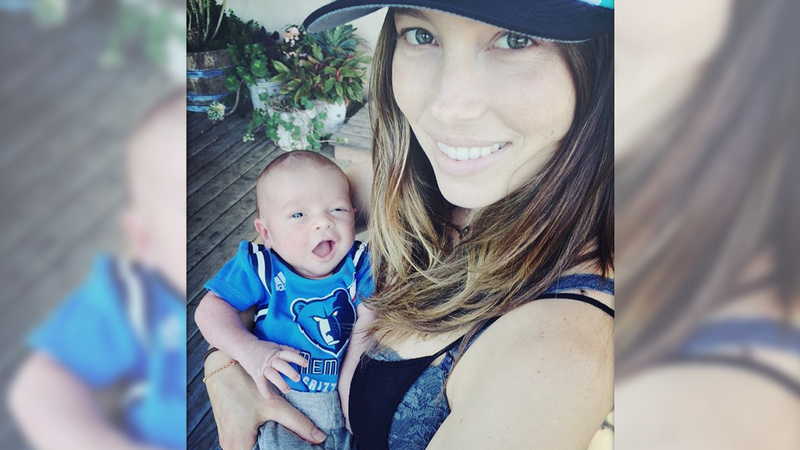 He captioned the photo of his wife Jessica Biel holding baby Silas Randall, "The Timberlakes are ready!!! GO GRIZZ! #GritNGrind #Playoffs #BabyGrizzROAR." The couple welcomed their son April 11, People magazine reported. Silas was the middle name of Timberlake's grandfather Bill Bomar. Randall is Justin Timberlake's middle name and also the first name of the baby's grandfather on his father's side. The singer first confirmed the pregnancy news back in January on Instagram. Justin Timberlake shared a picture of a bulging belly - presumably belonging to wife Jessica Biel - on Instagram Saturday, Jan. 31, 2015, his 34th birthday (left).